"I'm looking forward to it [but] I'm not at 100% yet." - Tyson Gay, talking about his Friday Golden League showdown in Brussels with Usain Bolt and Asafa Powell at 100m. 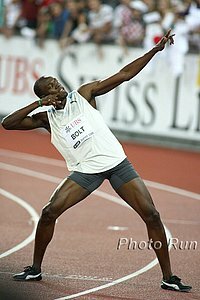 Bolt: 9.69 (WR). Powell: 9.72 (2nd all-time). Gay: 9.68 (wind-aided). Incredible matchup. Kate Reed In A Row With UK Athletics Over Morphine Comment Before Olympic 10,000m Final Reed claims she light-heartedly mentioned taking morphine to overcome an injury to UK athletics officials. So they had her take a drug and fitness test the day before the 10k.